Answer the following questions based on the following graphic. 1. Which is the root bridge? Ans – Bridge ID-1900A is the root bridge. A root bridge is a Switch which is located at the top of the network and connecting to other switches. 2. What are the designated ports? Ans – A designated port is the port on a segment which has the lease cost to reach to the switch. 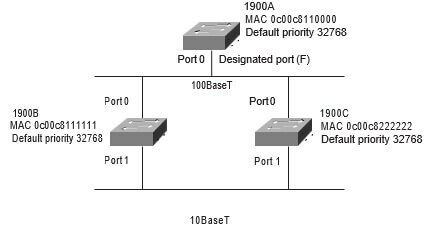 In this design port0 on switch 1900A is the designated port and port 1 on either switch 1900B, 1900C could be a designated port. A switch can have multiple designated ports but has only one ‘root port’. 3. What are the non-designated ports? Ans – A designated port is called a non-designated port if it has no root port. Non-designated ports have no role to play and are put in blocking state. 4. Which ports are blocking? Which LAN switch method runs a CRC on every frame? Which LAN switch type only checks the hardware address before forwarding a frame? Layer-2 switching provides which of the following? What is used to determine the designated port on a bridge? What are the four port states of an STP switch? What are the three distinct functions of layer-2 switching? What is true regarding BPDUs? They are used to send configuration messages using multicast frames. If a switch determines that a blocked port should now be the designated port, what state will the port go into? Switches can have many different spanning-tree instances per switch. Which LAN switch type waits for the collision window to pass before looking up the destination hardware address in the MAC filter table and forwarding the frame? What is the default LAN switch type on a 1900 switch? How is the bridge ID of a switch communicated to neighboring switches? How is the root port on a switch determined? How many root bridges are allowed in a network? What could happen on a network if no loop avoidance schemes are put in place? What is the default priority of STP on a switch?